All Year (naturist 16 May - 30 September). This is a relaxed, informal, spacious site alongside an extremely long and beautiful beach. 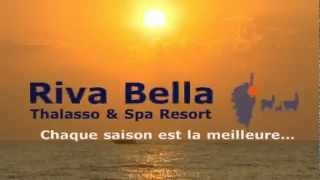 Riva Bella is open all year and is exclusively naturist from 1st April to 5th November only. The site is divided into several areas with 199 pitches (with 6A electricity), some of which are alongside the sandy beach with little shade. Others are in a shady, wooded glade on the hillside. The huge fish-laden lakes are a fine feature of this site and a superb balnéotherapy centre offers the very latest beauty and relaxation treatments (men and women) based on marine techniques. An excellent, beachside restaurant offers a sophisticated menu and has superb sea views. The charming owner, Marie Claire Pasqual, is justifiably proud of the site and the fairly unobtrusive rules are designed to ensure that everyone is able to relax, whilst preserving the natural beauty of the environment. Cars are parked away from the pitches. The Riva Bella management is respectful of the environment, using biothermal energy and many other green measures around the site. English and German are spoken by the cheerful staff. There were lots of happy, smiling campers here. High standard toilet facilities. Provision for disabled visitors, children and babies. Laundry. Large shop (15/5-15/10). Fridge hire. Lovely restaurant with sea views and menu for children. Ice creams. Excellent beach restaurant/bar. Watersports, sailing school, pedaloes, fishing. Balnéotherapy centre. Sauna. Aerobics. Giant chess. Petanque. Archery. Fishing. Mountain bike hire. Half-court tennis. Walking with llamas. Professional evening entertainment programme. Baby sitting service. Internet. Very good WiFi over most of site (charged). Site is 12 km. north of Aleria on N198 (Bastia) road. Watch for large signs and unmade road to site and follow for 4 km.